This "East Indies" tapestry shows a gorgeous map of the East Indies, otherwise known as Oceania. However in the 16th century in Europe, East Indies was the name of the South East Asia region and the islands of Oceania. In this gorgeous world map tapestry we see the islands of South East Asia as well as Australia and New Zealand. Also visible are tropical icons, which was an element used in art inspired by Oriental influences brought in and discovered by explorers. In this tapestry we see pineapple trees, palm trees and mangosteen. Even the border shows a collection of tropical plants and palms to frame the work beautifully. In the 17th century, cartography was always about the combination of science and art, and this is shown beautifully here in this work. 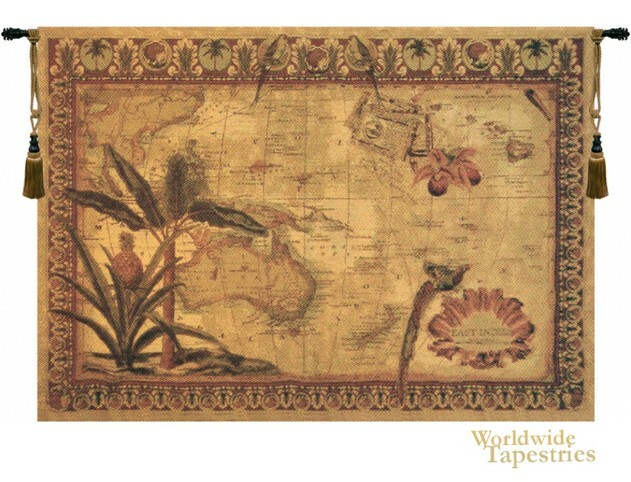 This world map tapestry "East Indies" is lined, and has a tunnel for easy hanging. Note: tapestry rod and tassels, where pictured, are purchased separately.